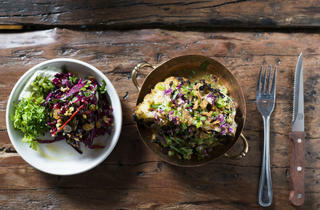 A hip Middle Eastern and North African grill house in Haggerston from former Ottolenghi and Galvin chef Josh Katz. If Fred Flintstone opened a dinosaur steakhouse, he’d do it in Dalston. This north-east nexus already has more places to eat great hunks of meat than Bedrock, yet there always seems to be room for more. 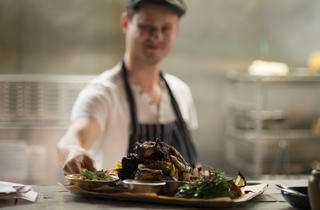 Perhaps it’s this safety in numbers, surrounded by London’s densest concentration of Turkish barbecue restaurants, that led chef Josh Katz to open a Middle Eastern grillhouse on the southern fringe of Dalston, where yet another pall of smoke is unlikely to attract attention. But that’s cool for Katz, because the cool factor and quality of Berber & Q still marks it out from the crowds. B&Q’s tucked away in a cave-like railway arch in a back street. Dance music hits you on crossing the threshold. The vibe’s like a bar or nightclub, except that here the staff greet you like old friends and guide you to a low-lit table. Their uncontrived charm is sustained for your entire visit. 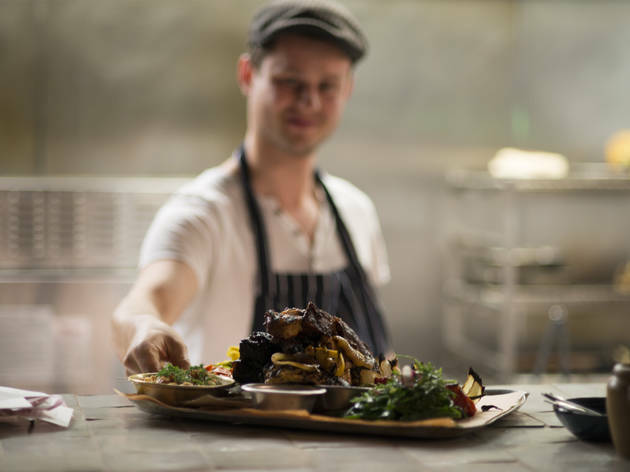 As at many of Haggerston’s other eateries, a Turkish mangal (charcoal grill) is central to the kitchen for searing meats and many veg. But Katz’s magic carpet has visited many places in search of inspiration. 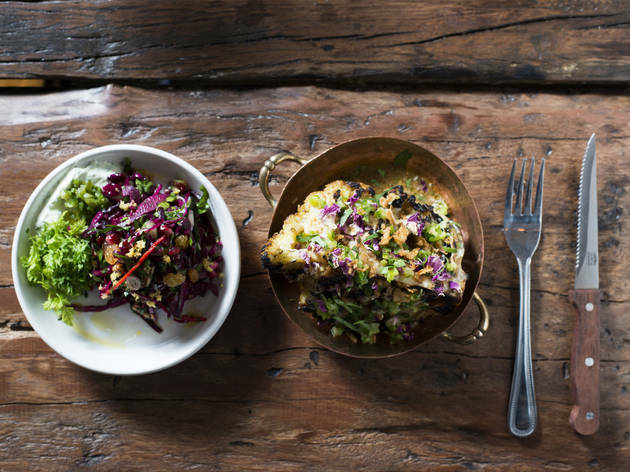 Joojeh, the Iranian dish of saffron- and lemon-marinated chicken, is served alongside shredded spit-roasted lamb, inspired by the Moroccan dish mechoui. That’s as close as the menu brushes to the simple rustic food that typifies Berber cooking, before it then flirts with more sophisticated Lebanese, Egyptian, and Sephardic Jewish dishes. You could describe the kitchen as ‘Arabesque’, but Arabian it ain’t. As at many barbecues, the pickles, sides and vegetables are more interesting than the meat. Chunks of beetroot are served on whipped feta and garnished with candied orange; grilled asparagus is served with toum, the Levantine version of aioli, then garnished with mustard seeds. Dill, coriander leaves and pomegranate arils are used as garnishes. 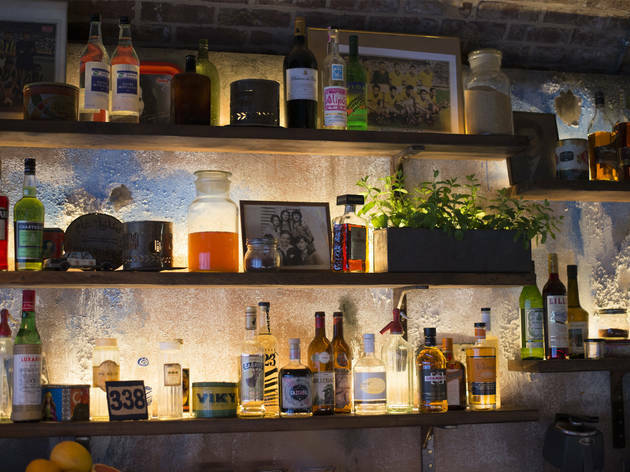 The music ramped up at 9.30pm to deep house, and – hell yeah – that drinks list beckons. If you don’t fancy a growler, or sucking down an Israeli or Moroccan lager, there’s a deeply unusual list of wines from Turkey, Morocco, even Georgia. 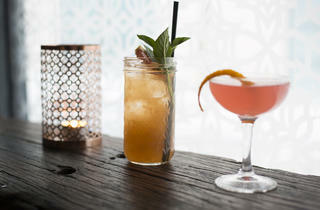 We suggest sticking with the cocktails, which are well made for £8. By the time you’ve had a couple of these, you’ll be ready to yell ‘Yabba dabba doo!’. Tue-Fri 6-11pm; Sat 11am-3pm; Sun 11am-3pm, 6-10pm. Berber & Q was everything we hoped for and more, we waited approximated 45 minutes for a table which on a Saturday night is not bad at all (they don't take bookings on small tables). We chose to sit at the bar which was a great decision, firstly the bar staff were friendly and helpful, explaining different cocktail choices and generally enjoying their jobs, secondly however although the music was great (quite house-y which I love) it was loud and not helped by the arch acoustics, sitting at the tables you could see couples struggling to hear each other and no cross table conversations - hence the bar was great, we didn't have this problem at all. We have a variety of meat and vegetarian dishes which were all fantastic (especially the cauliflower), definitely tapas style so sharing is great. An amazing venue with great decor. I would definitely recommend. 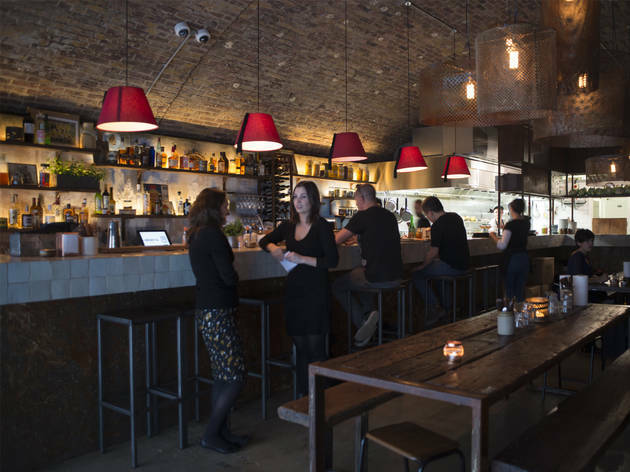 First of all, this grill house may be a bit of a pain to get too although based near Haggerston (Overground Station) with approx. 5 minute walk. I heard “Overground”…and concluded it would be a great idea to walk from Liverpool street, bad idea if it rains so maybe avoid it if you can. Once you do arrive, you are welcomed with open arms at this precious joint inspired by Middle Eastern Food Influences with décor to match - Berber Moroccan hats hanging from the ceilings. For added points it is worth noting that this is based in an old railway arch with its exposed brickwork for those architectural geeks and works great visually. With a combination of all this setting the atmosphere which will completely make you feel relaxed and ready for it’s delicious grilled food and drinks. I have been here twice now and both times have been super impressed mostly with its high quality of food, perfect flavors and great presentation. Definitely worth a visit! Berber & Q is something else!! The most delicious food I have had in a long time . Delicious food, great atmosphere, nice interior decor, good service. 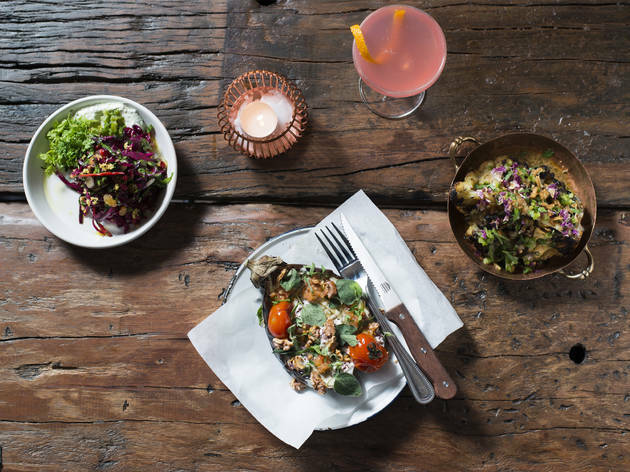 Located under one of the arches of Haggerston station, this restaurant with Middle eastern/North African cuisine will definitely keep you satisfied. The prices are quite high relatively to the portions but it might as well be better for groups of people - you can try various dishes and split the cost! Meat is delicious (and the reason to visit) but the dips and mezze are great as well. Highly recommended! Best restaurant I've been to this year. I cannot wait to go back and try more of the wonderful menu. We had a 45 minute wait for a table, not bad for a Saturday night. They'll call you when it's ready so you can go for a drink nearby whilst you wait. We were seated at the bar which was fine for food which arrived together on a tin tray. The Moroccan wine was a little too sweet but that's to be expected. Take delicious grilled meat and add it to middle eastern spices and you're onto a winner. We ordered the lamb shwarma, harrisa chicken wings, cabbage and hummus. It was more than enough for two. We also ordered fattoush but it never came, though I'm not sure we needed it. Dessert was an incredible coconut muhallebi, polished off with some complimentary shots from the barman. 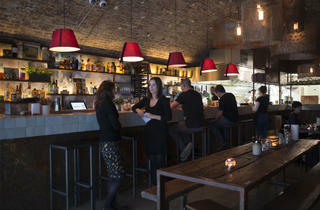 Price was very reasonable and the atmosphere was buzzing which is what you'd expect in Haggerston on a Saturday night. Just superb. Have now been 4x times and sampled most of the menu. Grilled meats perfectly cooked and all the veg dishes great also. We have several vegetarian friends who love it. The place has a great laid backed vibe and service is v friendly. The décor is simple and has an interesting feel being in a railway arch with brick walls and ceilings. There is a middle eastern touch to the décor with the vibrant cushions and cool lamps. The food was really nice - I loved the creamy flavourful hummus. The bbq was pretty good although not quite as melt off the bone as I might have liked. Overall, a really cool place. Try and order as much as you can! It's extremely satisfying being served a tray worth of delicious food. A great mix of dishes that has something for everyone and enough on it so you still want to come back to try something different. Already been there twice and not sure where this rumour of load music comes from!? 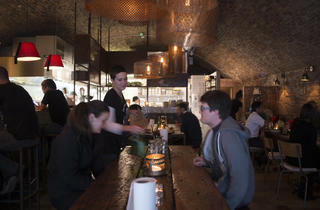 Both times it just felt like a lively / bustling restaurant in a railway arch. Make sure you get your soft boiled egg on your hummus! I'll be going back again. A lot of the reviews dwell on the loud music, but I didn't find this to be a problem. In fact, I barely noticed it, such was the outstanding quality of the food. Many rave about the cauliflower shawarma, and rightly so – it's mind-blowing. Make sure you order it, and have a go at making it yourself at home. One final thing: it's very easy to over order here, so be careful. The dishes came with a bunch of breads and nibbles that we weren't expecting – it was a nice surprise, of course, but we didn't actually need as much as we ordered. 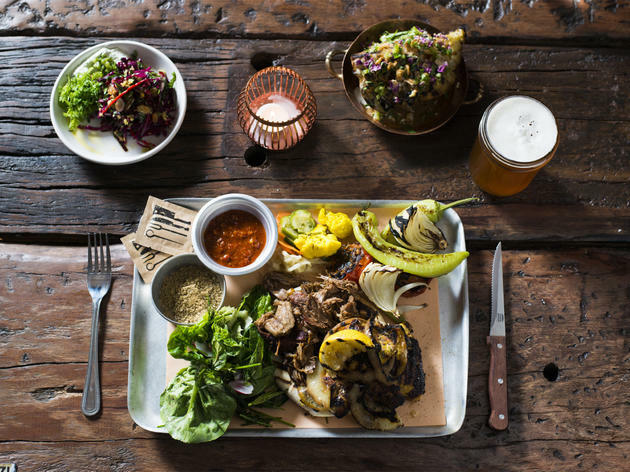 The best of American BBQ mixed with Ottolenghi's vegetables. 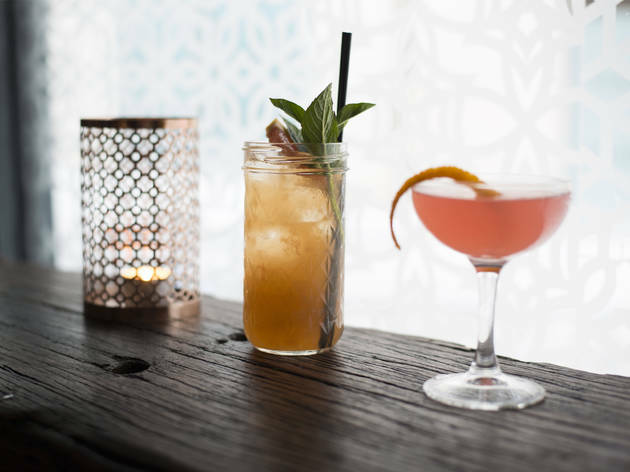 Wonderful cocktails! Had to wait a while to get a table but it was well worth it. Definitely ask for the additional garlic sauce - it's exactly like I've tasted in the Middle East and a perfect accompaniment to pretty much anything on the menu. There are also plenty of vegetarian and gluten free options, for those with dietary requirements. Will definitely be going back for much more! Got quite lucky and walked right in on Saturday night (WIN). Had a delicious Old Fashioned while the waitress explained the menu to us (pretty much one main and one side per person). 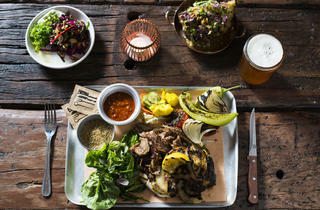 We had the pork belly and pulled lamb along with the cauliflower schwarma and slaw. Also som pickled carrots (as you do). The meats were deliciously moist and adding the garlic sauce really took it to another level. The meat was on top of the pita, annoying because you had to figure out how to get it extracted but delicious as it soaked up any juices-- giving it a wonderful flavour. The cauliflower was fantastic, a great example of vegetarian cooking at its finest. The slaw was quite innocuous but combined with the made a lovely accompaniment and offset the taste of the meat perfectly with its crunch. If you are planning a night out in Hackney (maybe at Draughts?) this is a fantastic shout if you can get through the door (they don't do reservations). There were many large groups there and its meant to be a sharing place so it caters well. I really wanted to love this place, not least because it's right round the corner, but also because I'm a fan of Ottolenghi and a devoted reader of Grace Dent's column and she was a big fan. I'd certainly say I liked it - the Haggerston arches provide ready-made atmosphere, helped along by the pumping soundtrack. Our cocktails were good: a light and refreshing Gal Gadot and a Jafooley Old Fashioned (only sweet toothed sippers need apply). My top tip would be to come with a large group, because the servings are on the generous side and we would have liked to try more! The lamb was quite dry, although accompanied by a particularly strong garlic sauce which upped the flavour ante. Sucuk sausages were good if not very memorable but the beets with whipped feta and saffron candied orange were the stars of the show for me. The bill was somewhat higher than we'd expected - if I were in the mood to blow out again I'd be more likely to head up the road to Rotorino. Delicious Turkish food served in a railway arch just off of the canal in Haggerston. Berber & Q doesn't take reservations so I wasn't sure how easy it would be to get a table. We arrived at 6:30 on a Wednesday and were seated right away. The restaurant didn't seem to get full until after 7:00. They do a great variety of cocktails - one that stood out in particular was the Haggerstoned - a mix of tequila, chartreuse, pistachio, and orange. The portions of food were a generous size and everything we ordered had so much flavour. 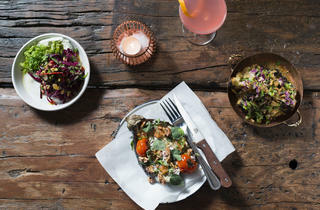 The meat dishes are served family style and there are a variety of seasonal mezze to go with it. The cauliflower shawarma and pumpkin tahini dip were particularly memorable. Went here for brunch on Sunday morning. 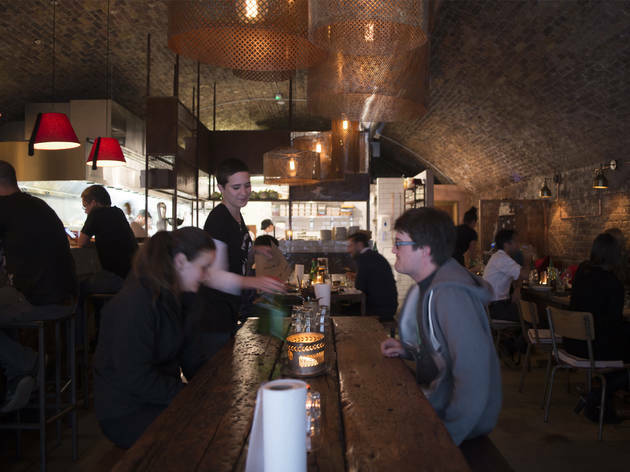 It's probably not the first place you'd think of heading to on a sunny day (it's in a low-lit, bare brick archway near Haggerston Overground) but the food was top notch. I ordered the Tunisian shakshuka - poached eggs in a rich red pepper and tomato sauce. It looked fantastic, beautifully presented in a metal pan with a side order of soft bread and fresh salad. The place was pretty quiet for brunch but I imagine it gets quite busy on an evening, and deservedly so, would definitely recommend. Went there a few weeks back and had the best time, returned last night and bitterly disappointed. Might have been the early arrival but the cauliflower tasted like it had been doused in lighter fuel, the wine was caustic, a serving of mixed pickles was little more than a tablespoon and only consisted of gherkins and a bit of cabbage and the chilli sauce on the side was barely enough for one mouthful of food. To top it off we had to sit through heavy hip hop instead of the excellent house music they usually play and had been a real draw factor for me. It was little better than a a good Turkish kebab house last night rather than the top restaurant it claims to be with the high prices to match - felt very annoyed at paying so much for what was no better than my local Turkish. Really shame as I had been craving the cauliflower since my last visit - clearly a hit & miss place or trying to cut back I so won't be back. I emailed Berber & Q a few weeks before going to ask if they would consider bending their ‘no reservations’ policy, for no real reason other than fear of being turned away and sulking all the way home. They said no, but in a very friendly way, so we made it our business to get there early last Saturday evening and arrived just before 7pm. It isn’t a large restaurant, there are two sharing tables running along the centre, another five or so smaller tables against the wall and a few seats at the bar. We were told the wait could be up to an hour so put our names on the list and were advised to enjoy a cocktail either at the bar or either of the next door bars but to stay close as we would receive a call. We opted for Draughts on the left, London’s first board game cafe, serving cocktails strong enough to get even the tamest gamers into the competitive spirit, but only two rounds in to a game of “put random items in chronological order by year of invention” we got the call, dropped our cards and ran. It’s questionable whether it was the call or choice of game that made me run. 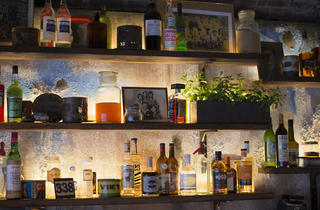 I enjoyed a ‘top shelf’ (bourbon, cider brandy, maple syrup, egg white and baharat) whilst deciding and people watching. The crowd was late twenties/early thirties and trendy. There was fairly loud house music playing that gave off Saturday night vibes, but interestingly they had completely different music in the toilets, much calmer traditional Middle Eastern music. With the help of our charming waitress we ordered a generous selection of meat and sides, specifically the hand-pulled fore-quarter of lamb (Mechoui), joojeh chicken thighs, smoked short-rib beef in date syrup glaze, mixed pickles, aubergine, beets with whipped feta, cauliflower shawarma in tahini and smoked beans with lamb neck. All the meat was fantastic, my only niggle was that the lamb was a tad too salty. The aubergine was a little on the boring side, but the other sides more than made up for it, especially the cauliflower shawarma that had crispy baked ends and the smoked beans with lamb that was like jazzed upcholent. I really enjoyed the festal nature of serving everything on one big informal platter. Not only does it lend itself to sharing but the flavours all mix together and underneath it all you have deliciously meat-juice-soaked pita with which to capture stray pieces of meat. After a substantial break in proceedings, we took a look at the dessert menu and couldn’t resist the chocolate and cardamom mousse and two Turkish coffees. The bottom layer of rich dark chocolate was deliciously offset by a little cardamom flavoured sour cream on top. We ordered more than enough and had cocktails so it wasn’t cheap but it’s completely worthwhile. The atmosphere is great and the food is extremely impressive. Very good veg options. Lackluster service so I took off the discretionary tip. Now to be more specific, I had the enormous hunk of charred hispi cabbage with harissa creme fraiche and the (enormous) cauliflower schawarma with tahini and rose. First of all, large portion sizes for tapas which is a plus. Second, very good flavours. The crunchy sea salt complemented the smoky cabbage and the harissa provided a mild kick. The schawarma was very tasty for cauliflower. I got the white wine from Meknes and it was mediocre. Only semi-dry with a lackluster flavour. Service was poor as to be expected in London. The manager was practically next to me and while he cleared my plates at times, he never bothered to ask how my food was, whether I wanted anything else, etc. FYI It's a very loud place and the music, although not overwhelming, doesn't help when trying to hear someone speak.